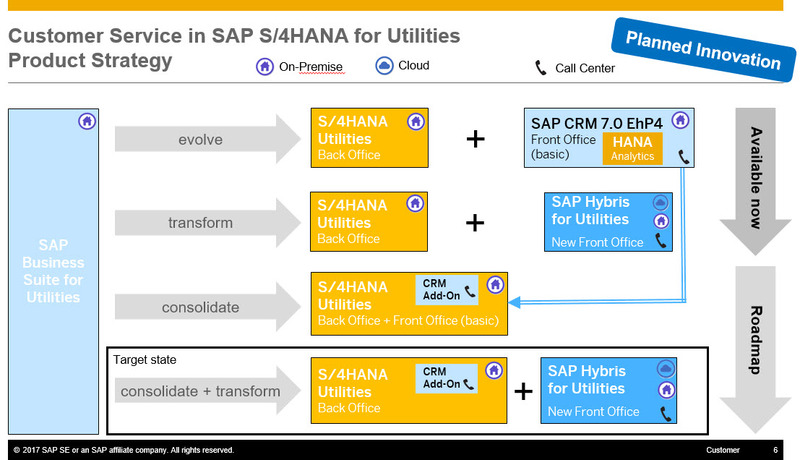 What’s the future of SAP CRM for Utilities (on Premise)? Would you like to reduce your TCO significantly while safeguarding your past investments into SAP systems? Is it your goal to simplify your system landscape while keeping a best-run contact center? Would you like to get rid of CRM Middleware while continuing to have the most complete, flexible, reliable customer engagement system available on the market? According to this post on Linked the CRM add-on is expected to be available with 1709 FPS01 in Q1 2018. I see this to be a CRM re-implementation. I am not sure if current CRM customers would consider a re-implementation as its expensive and time consuming. Thanks for your comment. With the CRM add-on, we intend to provide a simplified version of SAP CRM embedded within the SAP S/4HANA system – allowing our customers to safeguard their previous investments into SAP CRM. Therefore, for those customers that move from SAP CRM to the add-on on S/4, this is definitely not a re-implementation. And don’t forget the TCO reduction thanks to the elimination of middleware, since the CRM add-on and S/4HANA will share the same database. Hello – Is there list of SAP CRM components that will be ported to S/4 HANA? Other modules like SAP CRM Sales and Service will also be ported? Hi! interesting blog. If any customer use SAP CRM as standalone System, the license cost would be same as like integrated Scenarios?